London is one of the greatest multi-cultural and creative cities in the world, with international inspiration feeding into the city’s design community. Yet although the power of diversity to stimulate creativity is well established and despite this incredibly rich resource, the UK design industry remains stubbornly mono-cultural, with many different parts of London’s broader community unable to gain employment, access support and showcase talent. This is especially true for London’s black ethnic community. The established British design scene, moreover, requires new blood to maintain and expand its global position. Black British design offers a new source of talent that can be mobilised to enrich the UK design scene - both aesthetically and commercially. A point of celebration is required to demonstrate the quality of creative thinking derived from London’s and the UK’s small but significant African and African-Caribbean* design community. This should provide a positive insight into design skills, engage and inspire others and create a promotional platform for designers working in London, the UK, Africa and the Caribbean. In the spring of 2010 the British European Design Group (BEDG) proposed to organise a series of events in partnership with the London Design Festival (LDF) - to celebrate African and Afro-Caribbean creative talent. 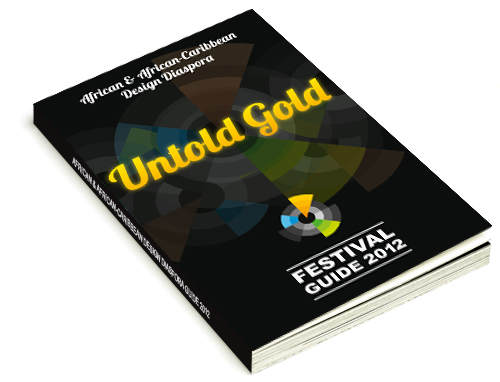 The first of the African and African-Caribbean Design Diaspora (AACDD) www.aacdd.org series of events were staged in September and October 2010 engaging the broadest possible range of creative talent to benefit from the Festival. The Programme has since rapidly grown into a much larger multi- disciplinary event schedule with national and International activity for 2011. It will culminate in a comprehensive event programme spanning part of the London Olympics and the London Design Festival in August/September 2012. The past and present series of exhibitions are, however, only one aspect of the AACDD Programme, which also features other supporting events, such as workshops, seminars, lectures, conferences and various AACDD Award Schemes. Social networking through the complimentary resources of the AACDD website and regular newsletters supports the aims of the Programme, exploits the impact of the exhibitions and provides ongoing stimuli for stakeholders such as funding bodies, potential sponsors, designers and others. In terms of the target audience, 46% of the UK’s black and ethnic minority population (BAME) live in the London area. Of these 380,000 are of African origin, 344,000 of African-Caribbean origin and 60,000 defined as “other black”. There are a further 110,000 people of African-Caribbean/English mixed heritage recorded as based in London. This provides a large potential audience base and talent pool, from which to select event participants and visitors. Involving as many of this group as possible in the London Design Festival experience will be one of the main AACDD objectives. A secondary source of creative talent and a potential audience is the broader African and African-Caribbean diaspora in other EU countries The 2-3 million residents of African and African-Caribbean descent residing in France and the 0.5 million African and African-Caribbean residents in Netherlands are within easy reach of London. AACDD is about promoting black British design and creative talent. BEDG will provide the organisational resources to promote a variety of creative individuals, studios and SMEs to ensure maximum impact through the design, management and promotion of the events. Links with other relevant organisations will be made working with hundreds of small groups across London, Europe and the world. The stakeholder groups, particularly black British design talent, will be engaged directly to assist in the selection of exhibitors, the design and presentation of the exhibitions, workshops, lectures and conferences, marketing and communications. By 2012 we expect to have forged close partnerships with local communities, educational institutions and other organisations working in similar sectors in selected neighbourhoods where large black populations exist.